The Liverpool and Manchester Railway (L&MR) was the world's first intercity passenger railway in which all the trains were timetabled and operated for most of the distance solely by steam locomotives. (The Stockton and Darlington Railway opened in 1825, but sections of this line employed cable haulage, and only the coal trains were hauled by locomotives. Horse-drawn traffic could use the railway upon payment of a toll.) The LMR was primarily built to provide faster transport of raw materials and finished goods between the port of Liverpool and mills in Manchester in north-west England. The L&MR was intended to achieve cheap transport of raw materials and finished goods between the Port of Liverpool, and Manchester, which was luckily in close proximity to reap the benefits of the vast amount of Textile raw material handled at Liverpool. The existing means of water transport, the Mersey and Irwell Navigation and the Bridgewater Canal, dated from the previous century, and were felt to be making excessive profits from the existing trade and throttling the growth of Manchester. (Similar feelings with regard to the railways led in turn to the construction of the Manchester Ship Canal in the 1890s). There was support for the railway from the cities at either end, but opposition from the landowners over whose land the railway was proposed to pass. The original promoters are usually ackowledged to be Joseph Sandars, a rich Liverpool corn merchant, and John Kennedy, then owner of the largest spinning mill in Manchester. They were influenced by the writings of William James. Now something of a forgotten figure, James was a land surveyor who had made a fortune in property speculation. He advocated a national network of 'railways', based upon what he had seen of the development of colliery lines and locomotive technology in the north of England. The Liverpool and Manchester Railway Company was founded on 24 May 1823. It was established by Henry Booth, who became its secretary and treasurer, along with other merchants from Liverpool and Manchester. A bill presented in 1825 to Parliament was rejected, but it passed in May the following year. In Liverpool 172 people took 1979 shares, in London 96 took 844, Manchester 15 with 124, 24 others with 286. The Marquis of Stafford had 1000, giving 308 shareholders with 4233 shares. The initial survey for the line was carried out by William James and Robert Stephenson and, being done surreptitiously and/or by trespass, was defective. Robert departed for South America and William James became bankrupt. Consequently, in 1824 George Stephenson was appointed engineer in their place. By this time, he was taking on too much. As Robert was absent, George (who could not do the calculations required, and had relied on his son for this part of the business) left checking the survey to subordinates. Upon presentation to Parliament in 1825 it was shown to be inaccurate (particularly in relation to the Irwell bridge), and the first Bill was thrown out. A key opposition figure in this had been G. H. Bradshaw, one of the trustees of the Marquess of Stafford's Worsley estate, which included the Bridgewater Canal. In place of Stephenson, who was now in disgrace, the railway promoters appointed George and John Rennie as engineers, who chose C. B. Vignoles as their surveyor. They also set out to placate the canal interests and had the good fortune to be able to approach the Marquess directly through the good offices of their counsel, Mr. Adam, who was a relative of one of the trustees, and the support of William Huskisson who knew the Marquess personally. Implacable opposition to the line changed to financial support, a considerable coup. The terms asked for by the Rennies proving unnacceptable, George Stephenson was reappointed as engineer with his assistant Joseph Locke. Previous experience with civil engineers set Stephenson against allowing Vignoles to continue his survey and he resigned. L. T. C. Rolt in his biography of Stephenson suggests that a faction on the Board continued to ask Stephenson for second opinions, and Rennie took umbrage at this. Vignoles may have resigned because he had been appointed by Rennie, and as an ex-army engineer thought it the honourable thing to do. The 35-mile line was a remarkable engineering achievement for its time, beginning with the 2250- yard Wapping Tunnel beneath Liverpool from the docks to Edge Hill. Following this was a two mile-long-cutting, up to 70 feet deep, through rock at Olive Mount, and a nine 50-foot span arch viaduct over the Sankey Brook Valley, around 70 feet high. Not least was the famous 4.75-mile crossing of Chat Moss. Having found it impossible to drain the bog, Stephenson began constructing a large number of wooden and heather hurdles, which were sunk into the bog using stones and earth until they could provide a solid foundation - it was reported that at one point tipping went on solidly for weeks until such a foundation had been created. To this day the track across Chat Moss floats on the hurdles that Stephenson's men laid and if one stands near the lineside one can feel the ground move as a train passes. It is worthy of note that the line now supports locomotives 25times the weight of the Rocket, which hauled the first experimental train over the moss in January 1830. The line was laid using 15-foot fish-belly rails at 35 lb. per yard, laid either on stone blocks or wooden sleepers. In 1829 adhesion-worked locomotives had not proved particularly reliable. 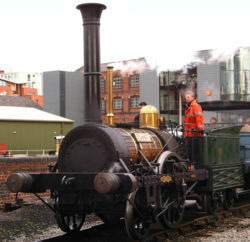 The experience on the Stockton and Darlington Railway was well-publicised, and a section of the Hetton colliery railway had been converted to cable haulage. The success of the latter method was undisputable, while the steam locomotive was still untried. The L&MR had sought to de-emphasise the use of them during the passage of the bill, the public having become alarmed at the idea of these monstrous machines which, if they did not explode, would fill the countryside with noxious fumes. Moreover, attention was turning towards steam road carriages, such as those of Goldsworthy Gurney. There was thus a division in the L&MR board between those who supported Stephenson's "loco-motive" and those who favoured cable haulage, the latter supported by the opinion of the engineer, John Rastrick. Stephenson was not averse to cable haulage - he continued to build such lines where he felt it appropriate - but knew its main disadvantage, that any breakdown anywhere would paralyse the whole line. The gradient profile of the line had been arranged so as to concentrate the steep grades in three places (either side of Rainhill at 1 in 100 and down to the docks at Liverpool at 1 in 50) and make the rest of the line very gently graded, say 1 in 2000. To determine whether and which locomotives would be suitable, the directors organised the Rainhill Trials. When the line opened the final passenger section from Edge Hill to Crown Street railway station was cable hauled as was the section down the Wapping Tunnel. 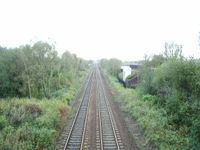 The line was built as double track. Firstly, there was no convenient means of operating the line as single track as the line predated the telegraph. Secondly, the amount of traffic was expected to require double track. A decision had to be made about how far apart the rails of the double track should be. It was decided to make the space between the separate tracks the same as the track gauge itself, so that is would be possible to operate over-gauge trains up the middle, something which probably never happened. In later years, it was decided that the tracks were too close together, restricting the width of the trains, so the gap between tracks was widened. The line opened on September 15, 1830 with termini at Liverpool Road, Manchester (now part of the Museum of Science and Industry in Manchester) and Edge Hill, Liverpool. The festivities of the opening day were marred when William Huskisson, the popular Member of Parliament for Liverpool, seized the opportunity of a temporary halt to alight and talk to the Duke of Wellington, then Prime Minister, through the Duke's carriage window. Standing on the permanent way, he misjudged the speed of the approaching Rocket and was run over, becoming the world's first railway passenger fatality. (He was not killed instantly; the locomotive Northumbrian was detached from the Duke's train and rushed him to Eccles, where he died in the vicarage). The somewhat subdued party proceeded to Manchester, where, the Duke being deeply unpopular with the labouring classes, they were given a lively reception (bricks thrown, etc), and returned to Liverpool. Notwithstanding the unfortunate start to its career, the L&MR was very successful. Within a few weeks of opening it ran its first excursion trains, carried the first mails, and was conveying road-rail containers for Pickfords; by the summer of 1831 it was carrying tens of thousands by special trains to Newton Races. Although the Act had allowed for it to be used by private carriers paying a toll, from the start the company decided to own and operate the trains itself. Although the original intention had been to carry goods, the canal companies reduced their prices, (an indication that, perhaps the railwaymen had been right to suggest their charges were excessive) and the extra transit time was acceptable in most cases. In fact the line did not start carrying goods until December, when the first of some more powerful engines, "Planet", was delivered. What was not expected was the line's success in carrying passengers. The experience at Rainhill had shown that uprecedented speed could be achieved. The train was also cheaper and more comfortable than travel by road. So, at first, the company concentrated on this, a decision that had repercussions across the country and triggered the " railway mania". Initially trains travelled at 17 mph, due the limitations of the track. Drivers could, and did, travel more quickly, but they would be reprimanded. By 1840, the track seems to have been largely replaced by parallel rail of 60-75 lb. per yard, with wooden sleepers. 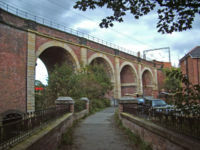 The tunnel from Lime Street to Edge Hill was fully completed in 1836, and when it opened carriages were separated from their engines and lowered to Lime Street station by gravity, their descent controlled by brakemen, and hauled back up to Edge Hill by rope from a stationary engine. The tunnel is approximately 1811 metres (1980 yards) long. On 30 July 1842 work started to extend the line from Ordsall Lane to the new Manchester Victoria station. The extension was opened on 4 May 1844 and Liverpool Road closed. Being one of the first railways, many lessons had to be learnt from experience, but not many passengers were killed except by their own negligence. The L&MR developed the practice of red signals for stop, green for caution and white for clear, which spread by the early 1840s to other railways in Britain and the United States. These colours later changed to the more familiar red, yellow and green. The L&MR was also responsible for the gauge of 4' 8½", or 1435mm), which came to be used more or less universally. In 1845 the L&MR was absorbed by its principal business partner, the Grand Junction Railway; the following year the GJR formed part of the London and North Western Railway. 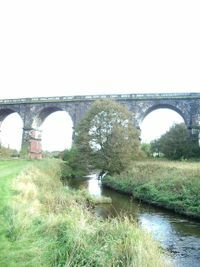 The original Liverpool and Manchester line still operates as a secondary line between the two cities - the former Cheshire Lines Committee route via Warrington Central is the busier route. A stopping service operates between Manchester Victoria and Liverpool Lime Street, while a fast service leaves from Manchester Piccadilly. Services are described in detail in the Liverpool to Manchester Line article. Edge Hill (at first Edge Hill linked Wapping Dock to the L&MR; Wapping Tunnel opened in 1829). It was also the site of its locomotive works.